GO AHEAD, KICK OUR TIRES. You don’t arrive at 35 years of success by taking shortcuts. At Perron, we’ve established our reputation by making people and punctuality a priority. Our greatest assets sit behind the wheel of our trucks. To accommodate time and temperature sensitive deliveries with unquestionable accuracy, uncommon customer service and a uncompromising respect for people. Today, our fleet has expanded to 40 trucks, but our sole vision remains the same. Every day, our certified, experienced drivers and friendly, dedicated team of associates continue to uphold the standards of this family-owned company by consistently meeting deadlines while exceeding customer expectations. When our drivers leave our facility, they drive with confidence knowing our support staff is right along with them bringing a combined 150 years of experience to the Perron team. Our trucks go the distance.  We currently transport to the following areas of the Midwest. Tim was married to Shellie in 1979 and in 1980 began driving a truck for his stepdad. They bought that first truck nearly two years later and for the first five years, Tim mainly ran local routes hauling cheese for Stella (Saputo) Cheese. After they purchased a few more trucks, expanding the customer base and introducing interstate business, Tim and Shellie eventually purchased the 4200 square foot building his stepdad owned and operated from. While continuing to expand the Perron fleet to 35 trucks in 35 years, they also continued expansion on the Perron headquarters. He added 3000 square feet of shop space in 1998, 600 square feet for offices in 2004 and added 4800 square feet of warehouse and dock space in 2010. Today, the 12,600 square foot building includes four offices, a shop, four docks and a warehouse. A resident of Campbellsport for 35 years, Tim enjoys spending free time in Eagle River with his wife and co-owner Shellie, their three children and four grandchildren. While a student at Campbellsport High School, Ike got his start at Perron as a part-time employee in the shop. After graduation in 1998, he attended St. Norbert College where he received a degree in business. While at St. Norbert, Ike maintained his connection to the trucking industry by working summers at Perron. He also worked at Ridgeway Trailer in De Pere during the school year and for a brief period after earning his degree. In June of 2002, Ike began his full-time career at Perron as a dispatcher and occasional driver. 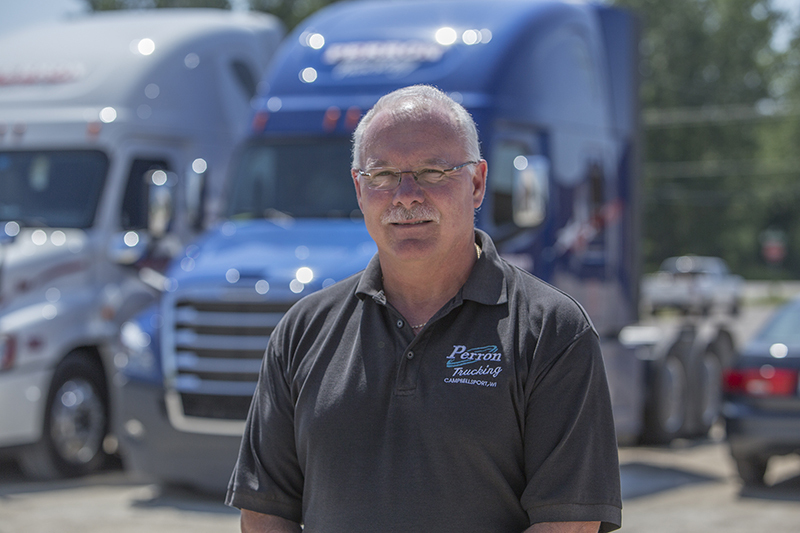 Over the years, while working his way to become the current Operations Manager, he helped expand the fleet and customer base all while aspiring to one day becoming the owner of Perron Trucking. A resident of Campbellsport, Ike enjoys spending free time with his wife and two children. The Perron Team is always thinking about how we can give back and stay connected. We participate in many different events, fundraisers, school activities and provide continuous support to our local, thriving community. We often share news, updates and some of our community involvement efforts on Facebook. This feed is directly linked to our Perron Trucking Facebook page. Perron Trucking is a family owned business that started out as a one truck company more then twenty years ago. Currently we dispatch 38 trucks, including company and owner-operators. 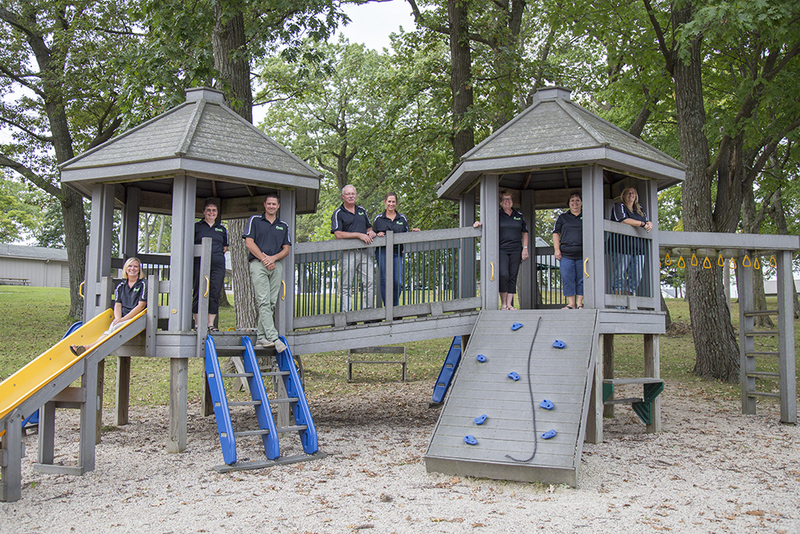 Our office staff consists of 5 full-time employees. Our main focus is offering an on-time, efficient, refrigerated service through out the mid-west.We pride ourselves on providing a friendly professional affiliation with our customers. 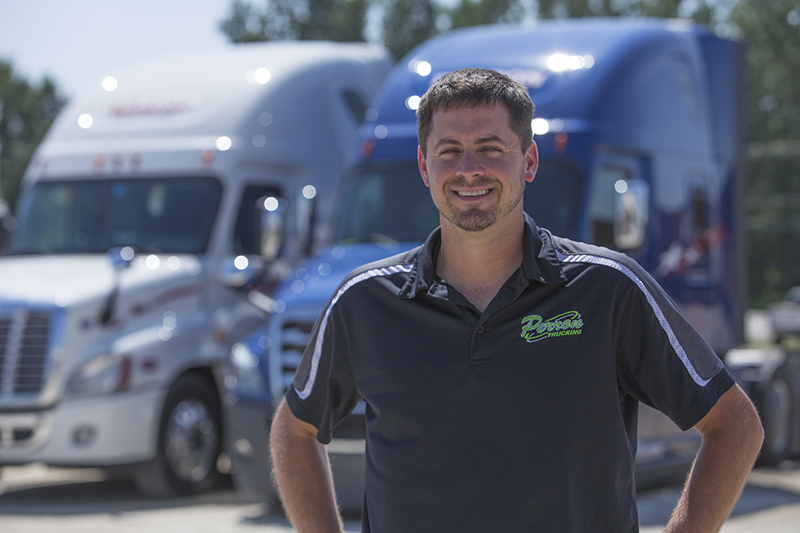 Commited to enhancing employee satisfaction, Perron Trucking offers an honest, family environment to its company drivers as well as its owner-operators. Happy Easter from Perron Trucking! We are almost over the hump, on our way to Easter weekend! We would like to thank all of our drivers for another successful safety meeting in the books.